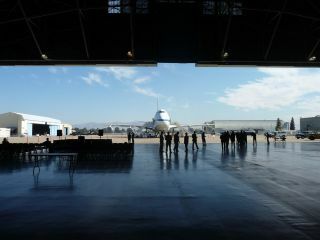 SOFIA as seen from a hangar at NASA's Ames Research Center in California. SOFIA stands for Stratospheric Observatory For Infrared Astronomy. Researchers plan to use the observatory to investigate star formation, the early universe, black holes and the composition of comets and planetary atmospheres, among other things. MOFFETT FIELD, Calif. — From the outside, NASA's SOFIA flying observatory looks like an ordinary 747 jumbo jet. But normal jumbo jets don't have a 17-ton infrared telescope sealed behind a bulkhead near the tail. The idea was to let folks learn about SOFIA and the science it will be doing over the next 20 years, officials said. A view up the steps of NASA's SOFIA flying observatory. The modified 747SP jet bears the name "Clipper Lindbergh." SOFIA just started flying science missions last year, and astronomers hope to operate it for at least two decades. SOFIA, a joint project of NASA and the German Aerospace Center, is a modified Boeing 747SP that carries a telescope with an 8.2-foot-wide (2.5-meter) mirror — the largest scope ever installed in an aircraft. SOFIA is the successor to NASA's Kuiper Airborne Observatory, which was retired in 1995. Like Kuiper, SOFIA is optimized to observe in the infrared range of the electromagnetic spectrum. But SOFIA should deliver much sharper images than its predecessor, researchers said. It's tough to do infrared astronomy from the ground, because the water vapor in Earth's atmosphere absorbs most of this radiation. At its cruising altitude of 41,000 to 45,000 feet (12,500 to 13,700 m), SOFIA gets above 99.5 percent of the atmosphere's water vapor, researchers said. SOFIA also offers another advantage over ground-based observatories: mobility. Astronomers can use the plane to chase down interesting one-time events, as occurred this past June when they dispatched SOFIA to watch Pluto pass in front of a distant star. This event, known as an occultation, was only visible from a tiny area over the Pacific Ocean. SOFIA's observations of the occultation could help scientists learn more about Pluto and its atmosphere, researchers said. SOFIA just started making science flights last year, but astronomers have high hopes for the airborne observatory. They plan to use it to investigate star formation, the early universe, black holes and the composition of comets and planetary atmospheres, among other things. The telescope will definitely earn some frequent flier miles. Researchers hope to fly SOFIA approximately 120 times per year for at least the next 20 years, officials said. Each science flight typically lasts between eight to 10 hours. A view looking tailward through the cabin of NASA's SOFIA flying observatory. At the back, two science instruments jut from a bulkhead. The instruments are attached to SOFIA's 17-ton telescope, which sits on the other side of the bulkhead. The first thing you notice when you come aboard SOFIA are the seats — or, rather, the lack of them. Most have been removed to accommodate the telescope and its supporting equipment and instrumentation. SOFIA carries up to 20 people on its science flights. A handful of front-facing seats remain near the front of the cabin for teachers, who take their experiences back to the classroom. Farther back is a sort of mission control, with several sets of seats arrayed near banks of computers. The telescope itself is not visible; it's hidden behind a bulkhead near the back of the cabin. That's a good thing. During science missions, a door on the port (left) side of SOFIA opens up, exposing the instrument to the elements. Without the bulkhead, life for SOFIA's passengers would quickly get very interesting, and very uncomfortable. "The telescope is basically floating," said Pamela Marcum, SOFIA project scientist at Ames. "It's almost fully isolated from the motions of turbulence experienced on the plane." A close-up of two SOFIA science instruments, FLITECAM and HIPO, which are connected to the telescope on the other side of the bulkhead. Science instruments can be removed and swapped out between flights; the plane usually flies with just one instrument aboard. Though you can't see the telescope from the cabin, you can get a look at the science instruments that use it to gather data. The instruments are attached to the telescope, but they sit on the cabin side of the bulkhead. These instruments include cameras, spectrometers and photometers, and they can be swapped out depending on requirements of the mission. Four have already flown on SOFIA, Marcum said, and several more will go up over the next few years. "Really, the science instruments are the heart of the observatory," Marcum told SPACE.com. Normally, each mission flies with just a single instrument. However, on Friday, two instruments jutted from the bulkhead. One was an infrared test camera called FLITECAM, and the other was the High-Speed Imaging Photometer for Occultations (HIPO). When SOFIA is aloft, the large door on its left side opens, exposing its 17-ton telescope to the elements and the heavens. SOFIA will be wrapping up its first round of science observations next month, with the next round slated to begin in the summer of 2012, Marcum said. But the SOFIA team won't get to put their feet up between these two periods. Managers will be selecting the second-generation SOFIA science instruments over the next few months, for example. And they'll keep tweaking, upgrading and improving the airborne observatory all the while, Marcum said. SOFIA's activities likely won't ramp up to full speed until the end of 2014. At that point, the team hopes to be logging about 1,000 hours on research flights each year, Marcum said. Thousands of people showed up at Ames over the weeked to get a look at SOFIA, according to NASA officials. That's not unusual; interest in the flying observatory has been strong wherever it has touched down. For example, about 5,000 people came out to see SOFIA when it stopped over in Germany last month, said Jan Woerner, head of the German Aerospace Center's executive board. "If you looked at the German newspapers, it was on the front page, with full-page reports," Woerner told SPACE.com in an email. "It was very good to have it here, for the understanding of science and technology. SOFIA is the best example I can imagine, and it’s an example of cooperation." SPACE.com staff writer Denise Chow contributed to this story. You can follow SPACE.com senior writer Mike Wall on Twitter: @michaeldwall. Follow SPACE.com for the latest in space science and exploration news on Twitter @Spacedotcom and on Facebook.